After performing for many years, dancers likely retire from the stage, explore their choreographic voice, go on teaching or change careers altogether. Yet, as the traditional model of the single-choreographer-run dance company is dwindling, dancers are taking new performing paths upon their retirement, thereby subverting the traditional invisibility of the aging dancing body and prompting dance writer Wendy Perron’s latest blog post Aging Dancers: An Alternate Vision. This trend was clearly demonstrated when Wendy Whelan retired in her late forties from the New York City Ballet last fall, after dancing for the company for thirty years. Rather than stepping out of the spotlight, she commissioned four contemporary dance duets for her project Restless Creature, which she has been touring since last year. Similarly, after dancing with the Martha Graham Dance Company for nearly 30 years, principal dancer Miki Orihara recently started her own project, an evening of solos entitled Resonance. Premiered at La MaMa in New York in 2014, it was presented at the Theatre of Yugen in San Francisco last month. The program featured Orihara’s breathtaking versatility. She easily morphed from the mischievous character of Martha Graham’s Satyric Festival Song (1932), to the sorrowful aging ballerina of Martha Clarke’s Nocturne (1978). The program also included Maenad from Jose Limon’s Dance for Isadora (1971), Prologue, a piece that Orihara choreographed for this program and New York-based choreographer Adam Barruch’s Memory Current (2014). 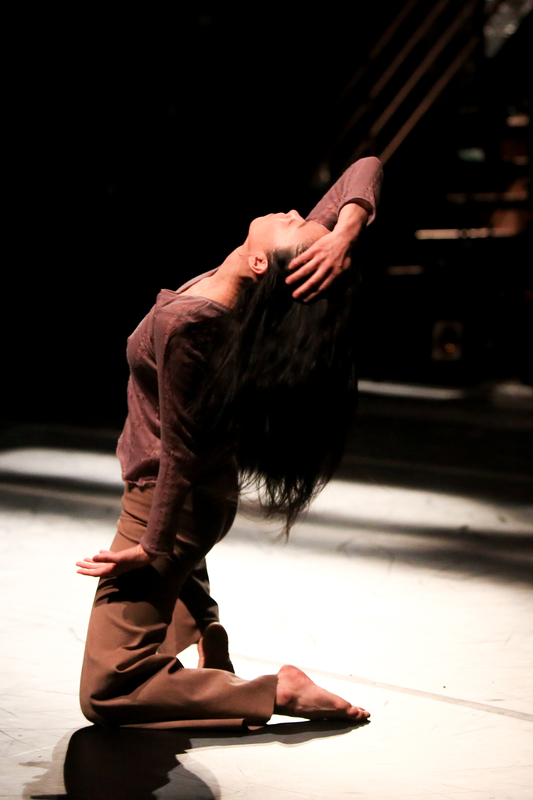 With a program that spans over 83 years of choreographic landscape, Orihara intends to show the continuity and lineage between modern and contemporary dance, as she explained in her program notes. Originally from Japan, Orihara came to the United States to pursue her dance studies. She joined the Martha Graham Ensemble in 1983, and the company a few years later. She was promoted to principal dancer and performed many roles of the Graham repertory. Orihara and I sat down to talk about her evening of solos while she was in San Francisco. Marie Tollon: You perform these five solos in chronological order but initially you had the order reversed. Can you tell us how you decided on this specific order? Miki Orihara: My concept is that you learn new things by learning old [ones]. So I wanted to do from new [work] to old [work], instead of old to new. But it didn’t work. I tried different orders, but it didn’t work, mainly because of my energy level. The hardest piece within the five solos is the Limon’s piece. The placement of standing is completely different in each dance. Martha [Graham]’s is very much on your heels. Limon’s is a bit forward, and Martha Clarke’s is all forward, but at the same time the weight is under here [she demonstrates under her hips]. I had a great time discovering all these subtleties. Also it was appropriate that I started from Martha [Graham]’s work because I was showing my training and background. I am from Japan and studied modern dance in Japan. My teacher was one of five pioneers of Japanese modern dance. When I came to New York, I studied at the Alvin Ailey School, I studied Limon technique, then I got to the Graham school and it made sense to me. La MaMa [Theater in New York] said to me: “Why don’t you show who you are now, so this performance shows the process of becoming who you are.” So I wanted to do Martha [Graham’s work]’’. I used to take class at Limon. I wanted to do a piece by somebody new, and chose Adam [Barruch]. I danced Martha Clarke’s piece about 7 years ago and I really like it so I asked her if I could perform her solo during this program. I wanted to cover the whole essence of dance. One beautiful thing about this particular program is that I got to work with the artists. I worked with Carla Maxwell, who is the Artistic Director of the Limon Dance Company. She was the original dancer for that particular section. I also went to Martha Clarke’s apartment and we worked together on the solo. I knew Adam [Barruch] from [The] Juilliard [School]. I saw his first composition showcase and he made a parody of Deborah Zall, who was his teacher at La Guardia High School. That was very impressive and I never forgot it. So I asked him to choreograph on me. MT: You mentioned that throughout this project, performing older pieces helped you understand contemporary works better and vice versa. Can you talk more about that? MO: In Japan we have a word that means “learning new by learning old” because there is so much knowledge in the old. It’s the same for everything, not just dancing. You are not learning anything new. If you study Shakespeare, you learn so much about theater, or lighting, or relationships. So that was the whole idea. MT: How did your knowledge of Martha Graham’s work inform working with Adam Barruch for example? MO: You don’t really see it but Martha Graham’s technique is in his piece so much. Adam has a Graham and Limon [technique] background so it worked perfectly for this program. There were a couple things that I couldn’t do in the beginning because I was just imitating. Adam does a lot of arm gestures. But he has long arms, long legs, it really shows well on him. I want to move like that, but I don’t have a body like that so what can I do? I asked him how to do something and after he explained, I understood the movement really came from the center. MT: How does performing contemporary work help you revisit Martha Graham’s work? MO: You learn exercises in the Martha Graham technique that you don’t see in the work on stage. Without that kind of training, it’s hard to move that way. All you do on stage is a variation of what you learned in class. When I go see a performance, I’m often impressed by how much dancers move. If I [was to ] do this, I [would] die! Often times, I don’t understand where the movements come from. If I work closely with the choreographer, I understand where they come from. I like that aspect of digging. Some choreographers are purely interested in forms, shapes, and the movements have nothing to do with the internal. As a dancer, you must have feeling when you are dancing that particular movement because you are a human being. If you don’t, you are not dancing. Many dancers don’t even feel anything. They are just told to lift their legs. MT: It is a hard program to perform, as each piece is a very strong individual solo. How do you manage the transition from one character to another? MO: It was an issue at the beginning, but it is not so much anymore. I feel like those five different persons are part of me. I have the mischievous of the Satyric Festival Song character and I have the crazy maenad in me. Martha Clarke’s piece is about aging. In the dance career, I am very old as a dancer. I’m now facing my dance career. Translating it into the dance is actually very hard. I love the acting part of it. I am facing the age so I don’t need to lie. MT: In Prologue, there is a long sequence of holding, with your fists and feet retracted. You support the entire space with that moment. MO: That’s also my background of Japanese dance. In Noh theater, you don’t move so much but you contain so much. Martha [Graham] always talked about how the hardest thing is to be still. I wasn’t still, I was moving very slowly, but there was so much tension. MT: Throughout your career as a principal dancer with the Martha Graham Dance Company, you have performed on large proscenium stages. For this project, you are performing in smaller, more intimate spaces. How does it change the experience for you? MO: Even though I have been dancing Satyric Festival Song in big theaters, how you project is different. I am not saying that the amount of energy is different but I can contain and bring it to me rather than going out with it. On the big stage, you have to go out. There are two kinds of dancers: the one who is physically out there, the other one who bring people in. And as a dancer, you want to be the second kind.